Let's face it, camping can be dirty. You may be looking for a way to wash your clothes while camping especially if you are going on an extended camping trip or want to pack light and still have clean clothes to wear at the campground. Wonder Washer from the Laundry Alternative claims to be the greenest way to wash your clothes. It is a highly portable, hand operated washing machine that’s economical, eco-friendly and leaves your clothes sparkling clean. The wonder washer cleans laundry in one to two minutes, is fully portable, no hookup is required. It is gentler on clothes and ideal for your most delicate camping clothes. Here is our full review. Campers no longer need to pack lots of changes of clothes for camping trips. The portable Wonder Wash is a lightweight, simple laundry machine that can clean 5-pound loads in just a few minutes. It packs easily in the car, requires no maintenance, and only costs around $60. On your next camping trip bring just a couple changes of clothes and clean the dirty ones with the Wonder Wash. Weight (empty): less than 6 pounds. Big enough to wash 7-8 dress shirts, 10 t-shirts, 4-5 bath towels, or 2-3 pairs of blue jeans. Works by filling the drum with soap, water, and clothes, and turning the drum for a few minutes. Requires no electricity, and there's no maintenance. It's sturdy, weather resistant, and rust-proof. Uses a patented pressure system to force detergent into clothes at high speed for an efficient wash. Ideal for washing delicate fabrics. It comes with a 30-day, no-hassle money back guarantee and a 1-year warranty. When I opened the Wonder Wash shipping box, I was amazed at how few parts were included. Although there were no assembly instructions, I easily put the Wonder Wash together in a few minutes. It's made completely out of plastic (except for the stainless steel screw-on lid), so there's nothing to rust. It looks like it would last a long time, forsaking any abuse. The instructions to wash clothes are so simple a kid could do it. Depending on the amount of clothing you're washing, you add a prescribed amount of detergent and water, then your clothes, and then you turn the handle for 2-3 minutes. After washing you stick the drain tube on the bottom, drain the soapy water, refill with clean water, and spin a few more times to rinse the clothes. Drain again, hang the clothes up to dry, and you're done ​washing. You can use hot or cold water, but cold water may require more handle turns to complete the wash cycle. 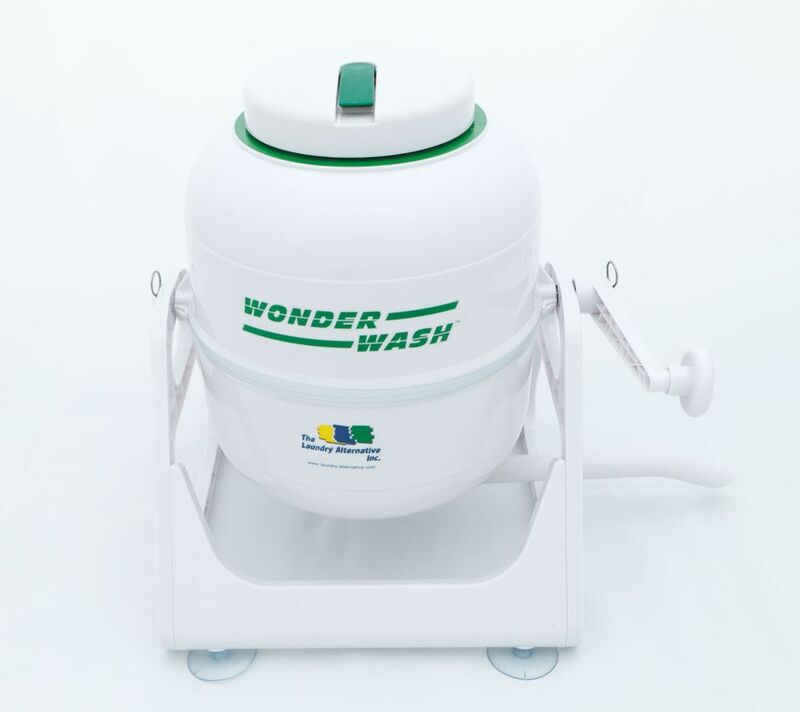 The Wonder Wash uses far less detergent than a conventional washing machine. Not only is it ideal for campers and RVers, but dorm students, singles, and apartment dwellers would find it useful as well. Why Carry Big Water Bottles Around When There's a Better Option?